When marketers use the term “social media,” most people immediately think of Facebook and Twitter. While these platforms have certainly proven beneficial in generating interest in many types of products, medical devices present a unique challenge for marketers because advertising claims are more strictly regulated than other products. In fact, over the last year, the FDA has begun to more strictly monitor marketing and advertising materials for medical devices over social media platforms. Therefore, it is important for medical device marketers to be aware of the risks of using certain social media platforms to promote a product. Marketers should be careful to choose the platform that minimizes risks and maximizes impact. The risk in social media often arises when a marketer interacts with other users in a way that is deemed improper by the FDA. For example, the FDA recently sent a warning letter to a company that “liked” a Facebook comment of a user describing an off-label use of the medical product they were promoting. The seemingly innocuous act of “liking” the wrong post is enough to get you in hot water with the FDA, which is the last thing marketers want. 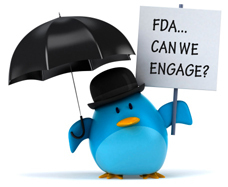 It is difficult for marketers to know what is appropriate social media behavior because the FDA has not provided much official guidance. The administration is currently seeking public comment on two guidances regarding social media and medical device marketing industry use, which may provide marketers with a better road map once they are finalized. Facebook and Twitter currently present the greatest risk for medical device marketers because of the nature of the platforms. Facebook encourages interaction, such as “liking,” and comments; these acts are essential to the success of a Facebook promotion. Comments, however, can be difficult to monitor, and “liking” the wrong comment can draw negative attention from regulators. Twitter, because of their 140-character limit, may not allow for marketers to adequately convey the information regulators require in order to not be misleading. The FDA will address this topic in a future guidance. With so much in the air regarding the regulation of social media and medical device marketing, what should marketers do in the meantime? Fortunately, video platforms, such as YouTube and Vine, offer the ability for potential users to interact with the product while minimizing the risk of drawing negative attention from regulators. These social media platforms allow users to learn about the product while eliminating much of the activity that can violate FDA rules. Comments can be disabled, and the success of the campaign largely hinges upon the quality of the video being presented—not activity involving other users. Marketers can present information in a straightforward, easily understandable format that complies with the rules, while still encouraging users to interact with the product. While marketers may be anxious to utilize the excellent marketing tools of other social media platforms, at the very least, marketers should proceed with caution if they choose to pursue platforms with space limitations or other activities that could earn a reprimand from regulators.